What do you do with a house full of guitars and a hurricane? Throw them all in the old Volvo wagon and evacuate? The amps too? I live right on the coast of Connecticut and right now they are predicting that the storm will make its next landfall on Long Island, New York and make a quick trip across Long Island Sound and hit coastal Connecticut where I and my family (and my guitars) live. At high tide. With a new moon. I, for one, think that the news departments of all the TV stations intentionally turn it into a bigger news story than it is. I worked at local news in New York in the 70’s and 80’s and I know how it works. If the story isn’t huge, then nobody watches your show. Also, the commercial stations stay on the air all day and get more exposure than usual and probably more revenue. So, the “better safe than sorry” news reporting has us evacuating and preparing for a 14 foot high tide. My house is built at 12 feet which is the exact height of the storm surge in The Great New England Hurricane of 1938. That was a Category 3 storm which hit at high tide on a full moon with wind gusts recorded of over 180 miles per hour. In contrast, the “storm of the century” that the media is hyping right now is a Category 1 and will likely be a tropical storm by the time it reaches my guitars. Wind gusts and sustained winds are already less than half of the ’38 storm. So, I’m not going anywhere. I brought in the patio furniture and the boats (it’s just a canoe and a kayak) and sandbagged the garage door. My wife, who is a bit of a worrier, has put me on “better safe than sorry” patrol bringing the antique furniture up to the second floor. I was annoyed that she fell for the old hype but, to be fair, if my guitars lived on the first floor, I probably would have brought them upstairs, too. Better safe than sorry. Tune in tomorrow for full coverage of the storm and its aftermath. If it gets too bad, I’ll lash myself to a pair of 335’s and my wife to a couple of SGs and float to safety. I can see it now. For Sale: ES-335 near mint with minor water damage. This is a 59 ES-355-the very top of the ES semi hollow line. But, lucky you, you can buy one of these for less than half the price of the bottom of the line ES-335. What do you get for spending half? PAFs, an ebony fingerboard, 7 ply top binding as opposed to 1 ply, a tortoise guard some fancy inlay work on the headstock. Take advantage of the ES paradox and buy one. They are great guitars. Hate the stereo and the Varitone? Take out the harness and put in a Dr. Vintage. It'll cost you a couple of hundred bucks plus installation. Put the stereo harness and Varitone circuit in the case for the next buyer. Most of you are aware there are three models in the ES semi hollow line: The ES -335, ES-345 and ES-355. There are other ES models (ES stands for electric Spanish) but only these three are semi hollow. The paradox here is, of course, that the most desirable and expensive ES model-as a vintage piece-is the bottom of the line, the ES-335. The conventional wisdom is that collectors appreciate the simplicity of the 335 and are willing to pay a premium for them. You could argue that “simplicity” includes simplicity of the circuit and that begins to get to the heart of the matter. 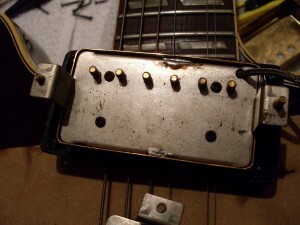 The 335 is a very simple mono 3 way switched 2 pickup arrangement whereas the 345 and most 355’s are stereo wired with the controversial Varitone in the circuit. But consider that the difference in price can be as high as 300% especially in the older examples. 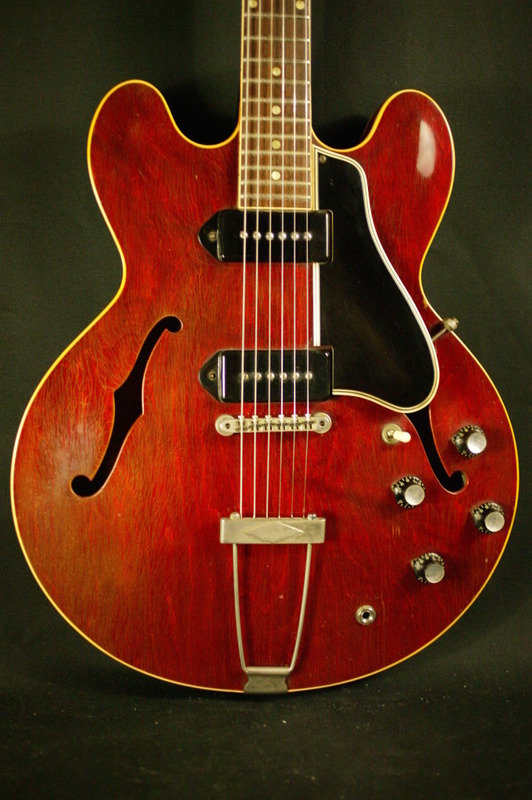 An average stop tail 59 ES-345 can be had for around $12,000. An average stereo 355 from the same year will command around the same price-perhaps a bit less since they are virtually all Bigsby or Maestro equipped. A stop tail 59 ES 335 will cost at least twice that amount and even three times that amount. It’s a little dangerous to make generalizations about price since there are about a zillion variables in the equation. But there has to be more to it than circuitry because the mono wired ES-355 doesn’t seem to command much more than the stereo version. Maybe 10-15%. But there are also compelling reasons to go for the fancier models. There is the quality of the wood and the quality of the construction. There is certainly a difference in the wood-the most figured examples tend to be 345s and 355s but figuring isn’t that important to 335 buyers. Not like the Les Paul folks. I’ve also found that the quality of the workmanship can be somewhat different on the higher end guitars-a little less glue slop, at least. Did Gibson have their senior guys work on the higher end guitars while leaving the lower end models to the “new guy?” I don’t know but it’s a pretty common practice. When I worked in a bike shop when I was in college, I was the senior mechanic and I built all the Colnagos and Masis that came in while the guys with less experience built the Schwinns. The point here is that the 345s and 355s are now the better deal by enough to sit up and take some notice. With the huge drop in the market, the guitars that have taken the smallest drop (in my world) are the most desirable guitars-the dot necks. This is significant. The block neck 335s have taken a huge hit and the 345s and 355s have taken an even bigger hit. If you’re OK with a Bigsby or “Custom Made” model, a PAF or early patent number equipped 345 or 355 can now be had for under $10,000 and sometimes well under. And that’s not a beater with big issues, that’s a solid 9.0 or better guitar with no major issues. So, how come, when you go to Gbase, they are mostly in the high teens and $20,000 range? Do yourself a favor and pick out a couple of them and watch to see if they sell. Month after month, the same guitars are there at the same prices. Same with Ebay. There are always 59-64 ES 345s for stupid money and, if you go to the “completed listings” you can see that they have been listed week in and week out. If you’ve always wanted a “Golden Era” Gibson, this is the time to be a buyer. Don’t be afraid to make what you think is a “lowball” offer. All the dealer can say is no. And while there are dealers out there with very fair and reasonable prices-I like to think I’m leading the charge-there are also dealers who post high but will sell low. Right now, I think a 345 or a 355 is a better investment than the stock market which is sinking or gold which is making new highs. If you’ve got $10,000 you can pull from the stock market and put into a vintage guitar, I’m betting that in five years it will have outperformed the stock you sold. Also, have you ever tried to play a stock certificate? No tone at all. Can't deal with a Bigsby? OK, there are plenty of stop tail 345s made until early 65. This is a nice 64 that'll cost you many thousands less than a same year stop tail 335. Same big fat 64 neck. Same pickups. Cooler inlays and, often, prettier wood. Want to save even more? Find a "Custom Made" version, take off the Bigsby and put on a lightweight stop. 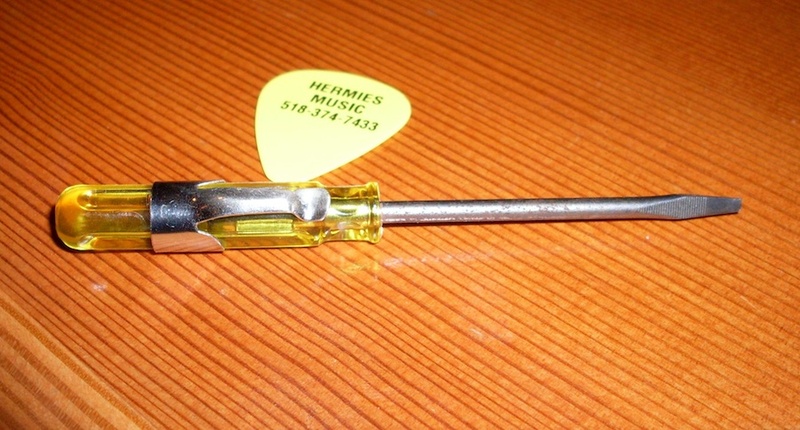 OK, so you'll have a few extra holes. You'll also have $5000 to as much as $10000 extra in your wallet than the guy who bought the stop tail '64 335. This one just sold at auction for over $11,000 which is pretty healthy in such a crappy market. I guess rare sells sometimes. Still, that's block neck 335 territory and a lot of dough for a 330. I was tempted but not that tempted. It walks like a duck but it doesn’t quack like a duck. And it will probably even float if you throw it in the pond. The ES-330 really is a very different guitar from it’s half brothers. It’s really part of the “other” ES-line that includes the ES-350, ES-295 and the ES-225 among others. These are fully hollow and have a very different tone and feel. The fact that the 330 has P90s rather than humbuckers is only one of a number of reasons that they don’t command anywhere near the premium prices you see for same year 335s. 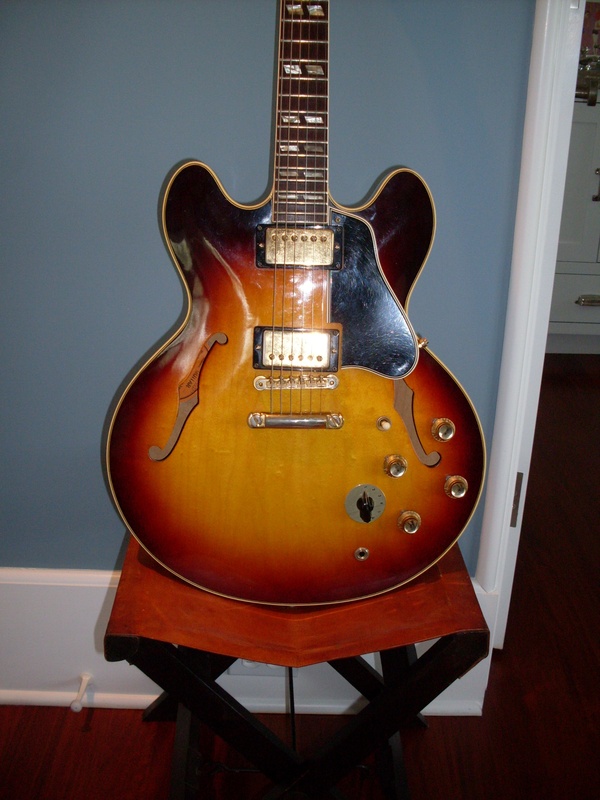 In fact, you can buy an excellent ’59 ES-330 for around $5000. Compare that to a 59 ES-335 which will cost you closer to $30K in the same excellent condition. The biggest difference, to me anyway, is the tone. A P90 is a great pickup but so much better suited to a solid body guitar. Crank up a 330 and it will howl like a wolf under a full moon; yes, they tend to feed back. My very first ES was a 330 that I bought for $200 back in 1966. It was a 62 or a 63 (nobody cared back then) with a factory Bigsby. 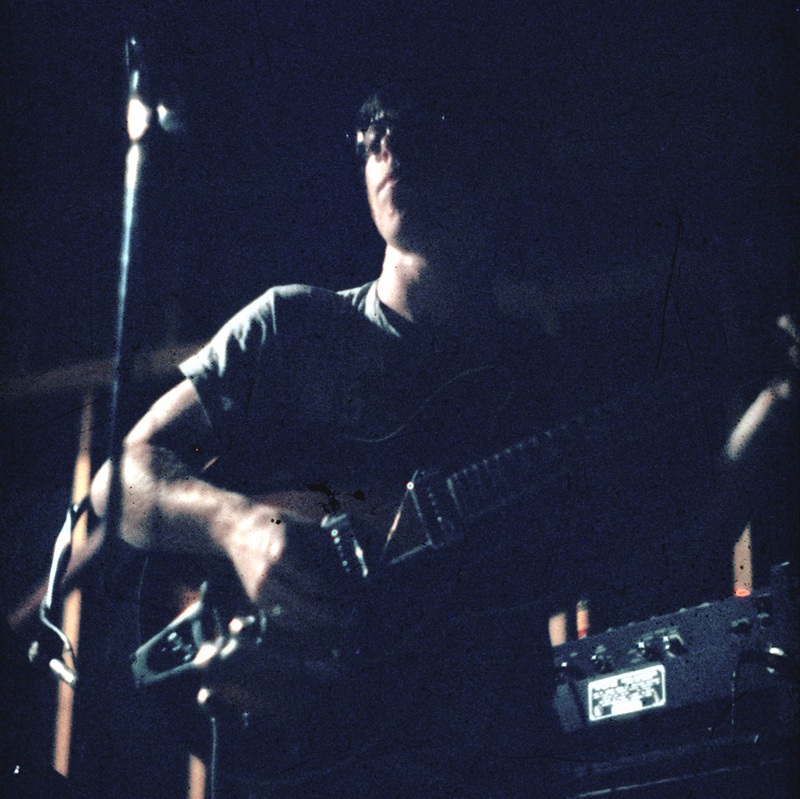 I played that guitar for years, constantly fighting the feedback unless psychedelia was the order and then I exploited that same feedback for earsplitting drug drenched effect. I don’t remember why I sold it or even when I sold it-hey, it was the sixties. I remember playing a friend’s 335 and noticing how much better the upper fret access was and I compared them and, sure enough, the 335 joined the body at the 19th while the 330 joined at the 16th. It made a difference. In 68 or so, Gibson changed the 330 to what some folks call the “long neck” version which joins at the 19th like a 335. Here’s the thing-the neck of a 335 is glued into the center block and is as stable as any neck on any solid body. Not so for the hollow 335. It has a conventionally glued heel with no tenon in the manner of a 335 and most Gibson solid bodies. All 330 came with a trapeze tailpiece or a Bigsby. You can’t put a stoptail on a hollow guitar-it will rip the top right out of it. That accounts for some of the tonal differences but most of it comes from the fact that it doesn’t have the center block. The 330 sounds like a hollow body. The 335 more like a solid. Makes sense. That was the intention of the center block in the 335. What’s good about them? Quite a lot actually. They weigh next to nothing. Six pounds and change is pretty average. They sound great unplugged and while the tone won’t blow away that J200 you have in the closet, it’ll be loud enough to enjoy during those moments when your wife is trying to read or watch TV. The 330 was clearly a guitar that cut some corners. 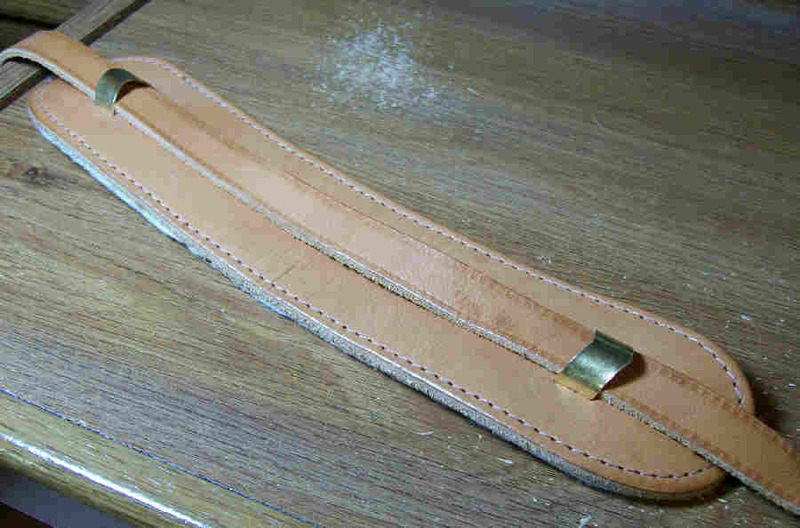 On the sunburst models, the back is brown. No sunburst on the back of a 330. 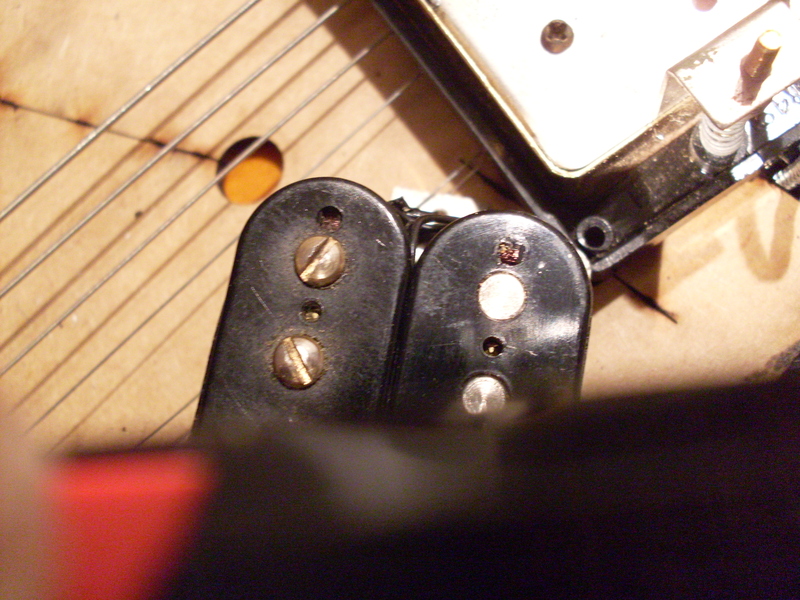 The tuners are the same Klusons as a 335 except they have the little oval buttons. Like the 335, they had dot markers until 62, then small blocks. The rest of the hardware generally follows the same timetable as the 335. Nickel turned to chrome in 65 and the knobs became witch hats in 67. I think the ones to get are the earliest ones. I’ve had a couple of 59s with that great neck profile but what I really love are the red dot necks with the old style black dogear P90s. That’s a great look. You’ll only find them in ’60, ’61 and maybe early 62. 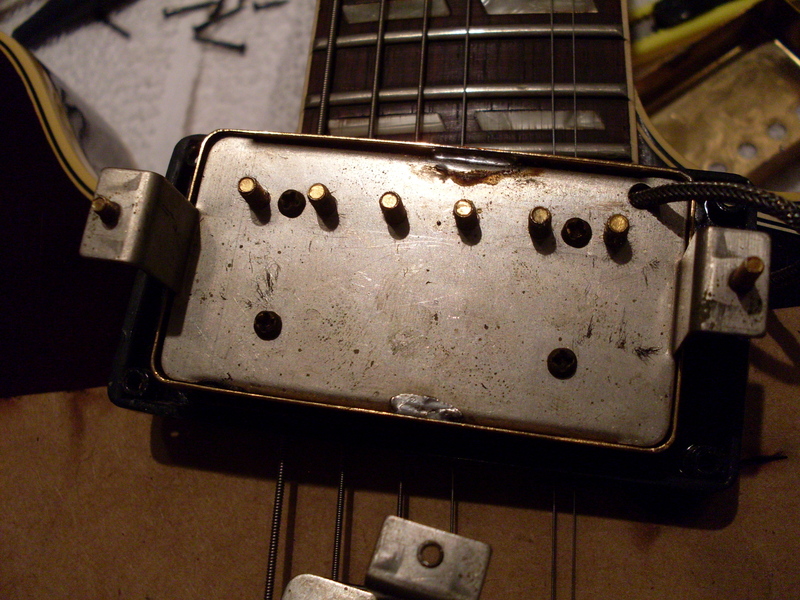 Then the pickups were chrome plated and the dots were gone. There are a few block necks with the black pickups from 62 as well. The “ears also followed the 335 timeline with Mickey Mouse ears from 59 until early 63. There is a single pickup version but I don’t like the pickup placement on them and I don’t think you will either if you play rock and roll. The ES-330 is a very cool looking guitar for not too much money. If you love 335s, you owe it to yourself to own at least one 330. You gotta love the look of these. The black pickups on the red guitar is a very cool look. Check out those ears too. Me with my '63 ES 330 in Spring of 1968 (age 16) at Scotia Glenville HS. Check out the Vox Royal Guardsman behind me. It was very cool to turn the head around. I'm sure I thought I was a pretty cool guy. I was, after all, the guitar player. This 1964 ES-345 has a secret. No sign of any sticker anywhere. "L" marks on the feet. Everything looks straight but is it? work on the guitar, I might have left them alone-a virgin harness is good enough for me to prove that the pickups are legit. But there were signs that perhaps the jack had been changed, so I asked the current owner (who actually wasn’t even the owner yet as he was involved in another trade to get this 345) if I could pull one of the covers. Why only one? The wear pattern on both covers was identical and the fact they both had no sticker convinced me that they were the same. The owner said to go ahead and open one. I don’t like doing that since it usually devalues the pickup but in this case, it was the only way to ascertain what the pickup was. If it was what I hoped it was, it would actually raise the value. So, I carefully heated the cover near the solder and popped the cover using a thin blade to break the solder before it had completely liquefied. To be honest, I was half expecting a T-top. I just had a bad feeling about this for no good reason. And there it was. The best of all possible outcomes-a double black wire, purple winding pickup. One more time-is it a PAF or a patent number? I think the absence of the PAF sticker defaults it to a patent number but think about it. If you were a buyer and somebody had two identical 345s-one with sealed pickups and no stickers and another with one open pickup and one sealed and no stickers, which one do you buy? I buy the open one because there is no certainty without opening one of them. So, why not buy the sealed one and open one of those? What would you have to lose? You would still wind up with one open pickup with no sticker. Simple. You might end up with an opened T-top (or fake) instead of an honest to God PAF/Patent #. It can be hard to tell the red windings from the purple in a flash photo but these are the purple ones-more brown really. The red ones are very coppery looking. Note the double black lead wires. They were changed a year later to one white and one black. 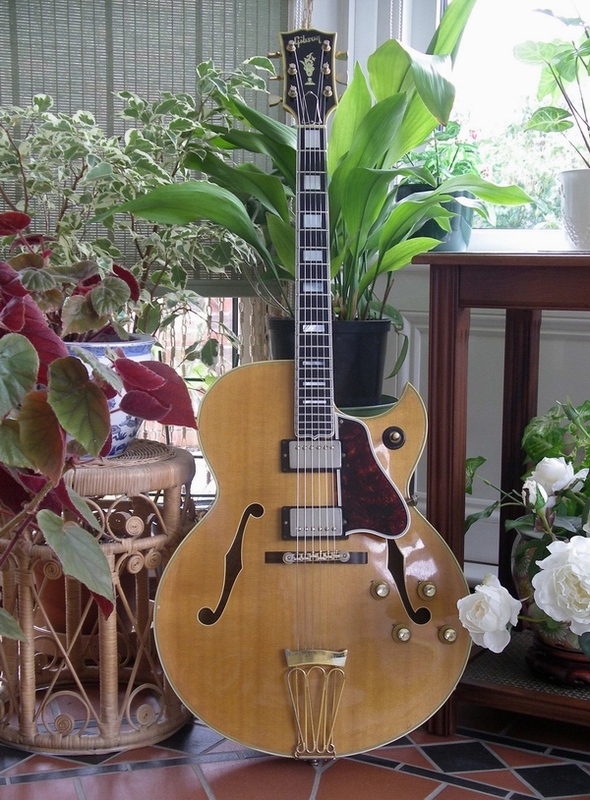 Here's a pretty shot of a 65 Byrdland that I snagged from the "Just Jazz Guitars" collection. Yep, some of these had a PAF in them. It's also pretty likely that it was made earlier than 1965. I often wonder how George Gruhn and a few others can be experts in all vintage guitars. By keeping my focus narrow-too narrow some say-I’m able to concentrate on the smallest and seemingly most insignificant elements of them. If I had to become an expert in, say, Telecasters, I’d have to own a few from each year, study them intently and write about them. That’s a couple years of work right there to get to the point I’ve gotten to over 20 years with 335s and their brethren. I could read everything there is to know about them but then I’d be just rehashing the same stuff everybody knows including the urban myths that seem to follow so many guitars around. 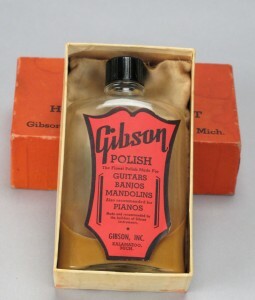 It’s like the “GIbson went back to 1 11/16″ nuts in 1968” myth or the “68 Les Pauls were made from leftover bodies” myth. There are quite a few of these and they get repeated over and over again. 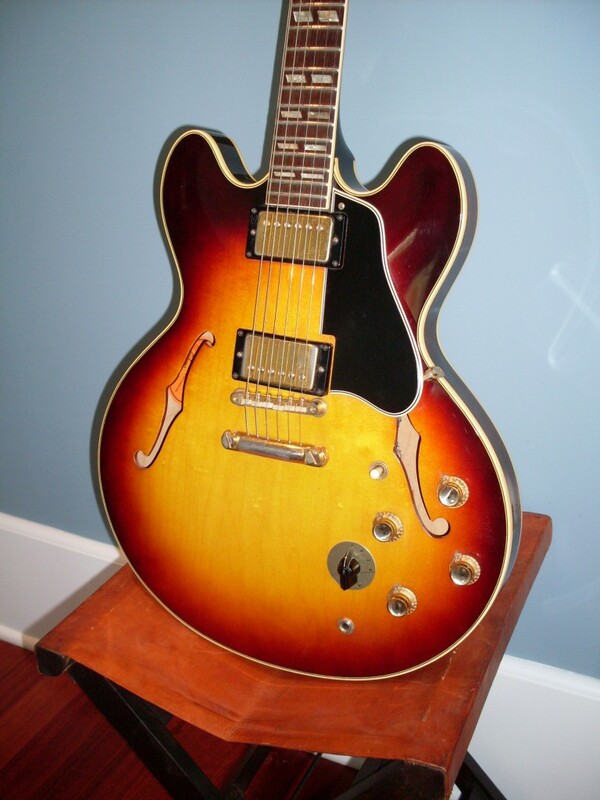 Recently, I received an email from a potential buyer who really wanted a 64 ES-345. He loved the neck shape-as I do- and he loved the pointier cutaways that showed up after Gibson retooled the 335 template in mid to late ’63. “I want you to find me one with PAFs. 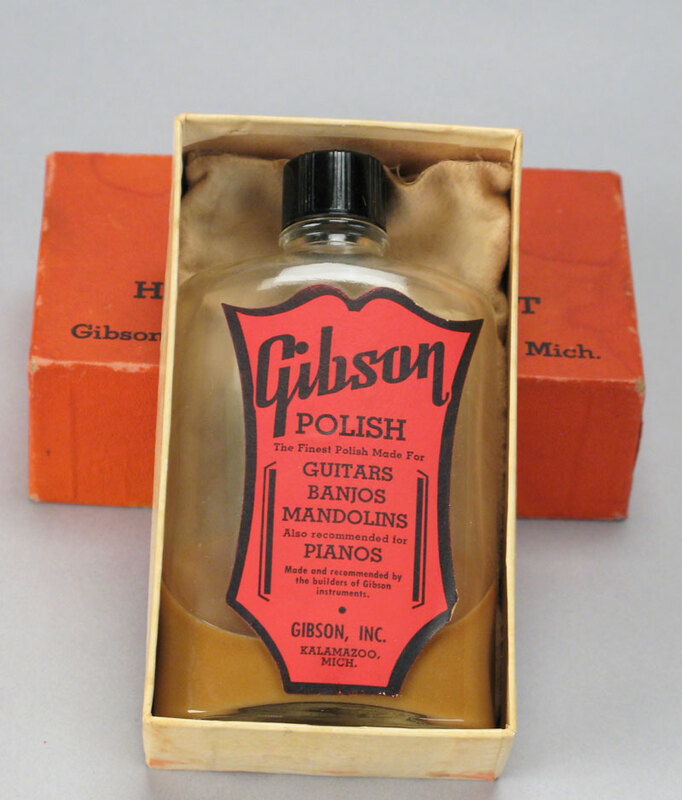 I know that the gold hardware Gibsons had PAFs as late as 1967.” Everybody says this and, somehow, of the 40 or 50 ’64 (not even ’67) ES-345s that I’ve inspected or seen photos of, I’ve yet to come across a single PAF. They made around 400 of them in 64, so I’ve only seen around 12% of them, so I could still be wrong but I don’t think so. Here’s where I believe the information comes from: The big archtop guitars often had a narrow spaced neck pickup (and some had both pickups narrow spaced). These were low volume instruments and they sold very few of them. In fact, by ’64, a lot of the big hollow bodies with gold hardware had gone out of production. The ES-350 was gone by ’63. The Switchmaster was gone. The ES-295 was gone. The were only 42 Super 400’s, 76 Byrdlands and 52 L-5CES’s. The rest of the big hollow bodies had nickel parts, I believe (Kessel, Farlow). My contention? The only guitars you will see with gold PAFs after 1963 are these low volume instruments that were likely built before 1964 and got their PAFs in 63 or earlier and sat at the factory until some music store somewhere got an order for one. I also know, from speaking to a former Gibson employee that the manufacturing floor at Gibson in 65, 66 and 67 was chaos. They had so many orders, especially for lower end guitars that it was hard for them to keep up so when you see these minuscule numbers of archtops during the period, it makes more sense that they weren’t spending their time building the high end stuff because they weren’t what was selling. As I mentioned, there were 400 or so ES-345s built in 64. By ’67, there would be 1144. ES 335s are even more dramatic -about 1240 in 64 up to 5700 or so in 67. So, it’s clear that they kept on building the gold hardware 345s in large numbers but saw an actual decrease in L5CES’s, Byrdlands and S-400’s. I don’t have the shipping totals through 67 on these but the fact that the numbers of the big archtops dropped from 64 to 65 which marks the start of the “guitar boom” that followed closely on the heels of the British Invasion shows that the PAFs that do show up in were either narrow spaced or perhaps mounted in previous years models that were carried over past ’63 when nickel covered PAFs are known to have run out. So, is there a ’64-’67 345 with gold PAFs? I don’t think there is. Are there high end hollow bodies with them past ’64? I would say yes as there is documentation that they exist. If someone out there has a 64 or later ES 345 with a PAF in it that is original, send me a photo. I will eat my words (as long as I can eat them with a scoop of ice cream). 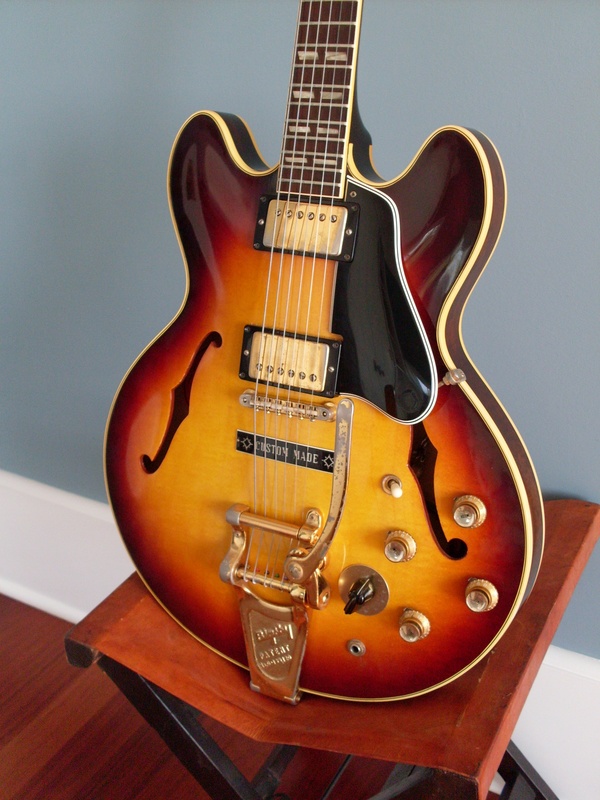 Here's a very nice ES-345 that I had for a very short time (these don't last). It had 2 patent number pickups. Just like all the 345's after 63 that I've seen. PAFs in a post 63 ES-345? Go ahead, find one. I dare ya. Got polish? If you do, it didn't come with the guitar.